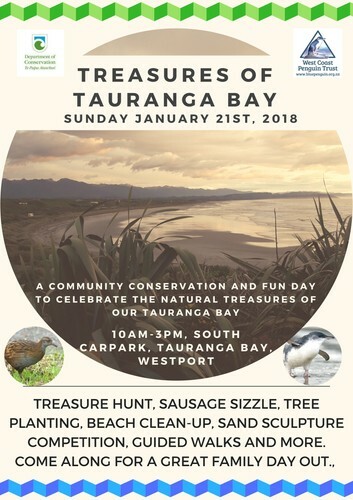 Come and find out about the Biodiversity Treasures of Tauranga Bay and the projects happening there, connect with the people who are working to protect it and come for a great day out with loads of activities for families and people of all ages. Pick up a treasure map to take a self-guided tour of some of the treasures of tauranga bay. Follow the map to collect your treasure. Build a sand sculpture of one of the special creatures who lives here. Guided Walks and Talks - Seabird Ecology, Seals, Penguins With Experts Kerry-jayne Wilson and Scott Freeman. Meet some conservation dogs and chat to their owner about how to be a responsible dog owner. Buy a tree to plant and one to take home. Take part in a beach clean-up and kid's kite-making workshop. Enjoy coffee, ice cream and sausage sizzle.